​Born and raised in the Boston area, Cynthia Maurice attended the Pratt Institute before graduating with a BFA and MFA in painting from Boston University. Later, she attended School of Visual Arts in New York and earned a second MFA in illustration. 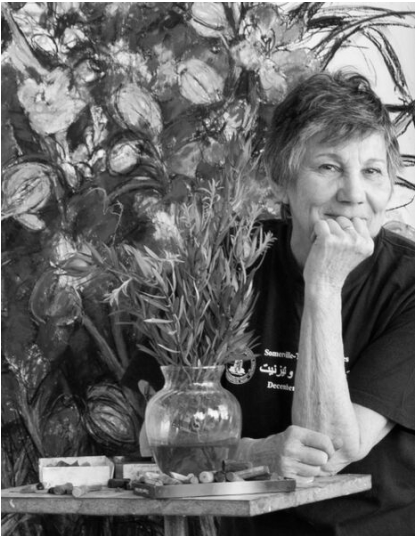 In 1986, Maurice helped co-found the Brickbottom Artists Association, a Somerville cooperative live/work environment of 120 artists located near Union Square, where she still maintains a studio. She is also a member of the cooperative gallery Galatea Fine Art in Boston. Cynthia Maurice’s work has been exhibited in numerous group shows at various venues, including Concord Art Center, the Danforth Museum of Art, Fitchburg Museum of Art, the Mills Gallery at the Boston Center for the Arts, the National Arts Club in New York City, and Brickbottom Artists Gallery. Most recently her work was shown in the exhibits “Cannot Be Described in Words: Drawing/Daring” at The Art Complex Museum in Duxbury, MA; "Arts Connect" at Catamount Arts Centers in St. Johnsbury, VT; and Out the Window, Around the Town" at Brickbottom Art Gallery in Somerville, MA. A major retrospective of Maurice’s work appeared at the Freeman Gallery of Albright College in Reading, PA in 1998. Other notable solo shows include “Fresh Cut” at the Newton Free Library in 2009 and “Fresh Cut-New Work” at the New England Currents Gallery of the Danforth Museum. In the past few years, she’s had two solo exhibits at Galatea Fine Arts: “Colossus, Works on Paper” in 2012 and “Gloves Off, Hands On” in 2014. Over the course of her career, Cynthia Maurice has received several distinguished awards and honors. After being named a finalist in the categories of Painting and Drawing by the Massachusetts Council on Arts and Humanities early in her career, in 2002 she was granted a Massachusetts Cultural Council Award in the category of Drawing/Prints/Book Arts. In 2010, her drawing “Almost” was selected by co-jurors Jen Mergel of the MFA and Helen Molesworth of the ICA as First Prize winner in the Danforth Museum of Art’s annual juried exhibition Off the Wall. Most recently, she has been awarded membership to The Boston Printmakers at Lesley University College of Art and Design. Maurice has served as art ambassador to Somerville’s sister city of Tiznit, Morocco, accompanying Somerville’s mayor there in both 2009 and 2011. In addition to her work as a painter, her editorial illustrations have been published in The New York Times, The Boston Globe, The National Law Journal, and The Washington Post.